Looks exactly as pictured. Goes perfectly with a rustic decor. Look outside of the box with this original wall clock. 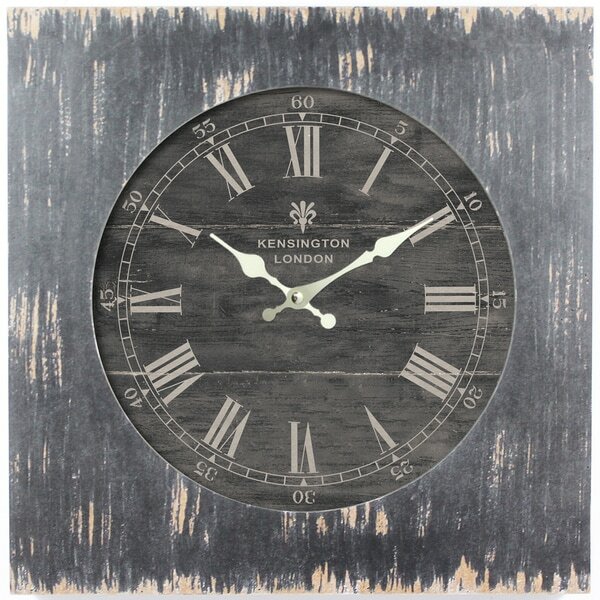 This one of a kind clock is enclosed in a wooden frame that has a distressed black finish. The dial is a darker shade of black that is not as distressed as the frame. The clock has roman numerals with gold hour and minute hands to give it a touch of fancy. The words Kensington London are stamped just below the twelve with a fleur-de-lis emblem. "Does this clock make any noise? Will I hear tick, tick,ÃÂ¢ÃÂÃÂ¦ÃÂ¢ÃÂÃÂ¦"
Hello cigarshane, this has whisper quiet movement. Thanks for shopping with us!